This is the Vehicle Industries version of the Hiclone Fuelsaver (see www.fuelsaver.com.au). Hiclones are normally placed in the largest diameter sections of the engine inlet system. The manufacturer’s VSV valves are placed in the inlet ports, which are the most restrictive point of the inlet system. Every modern engine has two inlet valves per cylinder, the VSV is located in one these inlet ports on each cylinder. For most of the driving time it shuts off the airflow completely through half the engines inlet ports. The permanently open port is angled to cause the airflow entering the cylinder to naturally swirl, improving combustion, emissions & torque. 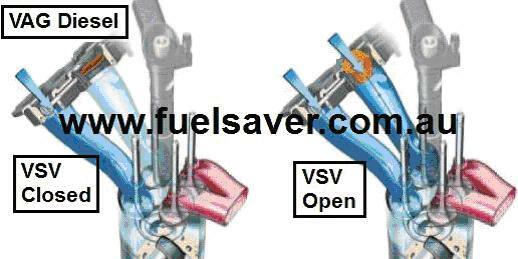 But the VSV system frequently fails; meaning the second inlet port never opens & restricts high rpm performance by halving the engine’s intended airflow. This commonly happens on Mercedes / Jeep V6, Audi / VW / Porsche (VAG) early V6, & costs a few thousand dollars to fix. The newer VAG V6 now has a single VSV valve located in a similar position & distance from combustion as what has been recommended by the Hiclone Company for the last 20 years. Adding Hiclones to these engines along with a Diesel Tuning System has proven benefits. It is only possible to add fuel to the point where the Air/Fuel ratio allows it to still burn. Hiclone increases the engines ability to burn fuel. So more power can be generated by - combining Hiclone & a Tuning System, than just the Tuning System alone. Hiclone also helps the engine to run cleaner, the swirling vortex helps to carry the soot particles from the EGR system to the combustion chamber, instead of them landing on the inside surface of the inlet manifold. www.morepower.com.au is the only company which has all of the different styles of Tuning Systems available within our product range and are able to provide the system which best suits the individual engine.